Warmer weather is just around the corner (we hope! ), and while it may feel tempting to lean in to all the new spring trends, purchasing seasonal staples to build your wardrobe around should be top of mind. To that end, we're here to suggest a practical yet chic approach to spring shopping… and drawing inspiration from the model-off-duty style of Behati Prinsloo, the new face of 7 for All Mankind’s spring campaign. The brand's latest collection nailed it, and we're now fully planning on making our elevated staples the star of the show. Everybody needs a selection of updated denim (we love these High Waist Slim Kick jeans), fresh tops, and an edgy leather jacket. Not sure where to begin? Scroll to shop all the model-approved staples you'll want to wear long after spring has passed. 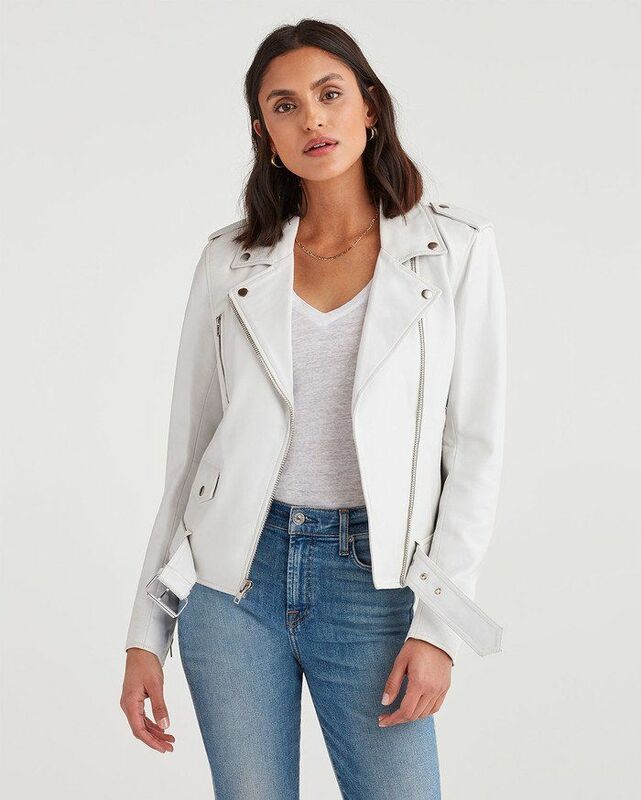 You can never go wrong with a moto jacket, but we love this fresh take in white. These slim-kick jeans are showstopping, especially when worn with a pair of heels. Swap your boyfriend T-shirt with a more fitted ribbed scoop-neck style. We'd wear these dark-wash flares with 7 For All Mankind's Basic Biker Jacket we showed you earlier. This tie-front top is perfect for a Saturday morning coffee run. Off-duty style isn't a thing without a pair of statement jeans that can take you from day to night. We love this paperbag waist style that makes tucking in tops a cinch. It's pink. It's flowy. It's a spring must-have. The frayed hem on these slim kick jeans are everything. For warmer days ahead, this tank is great to layer with a long duster you can peel off if it gets too warm.